Amazon Music Unlimited vs Apple Music, Who's The Winner? 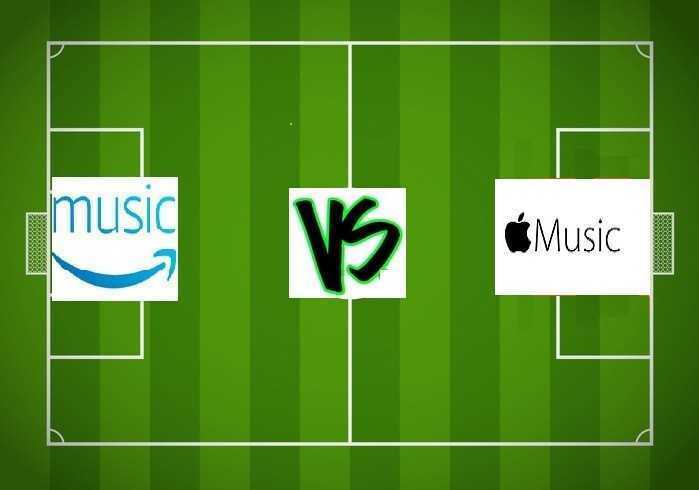 Online Music Store Amazon Music Unlimited vs Apple Music, Who’s The Winner? The craving for music varies from one person to another, it’s not only about the current mood of a person, but also hugely depends on every individual’s personality. For example, a tall muscular guy would prefer Heavy Metal or Rock music but a short, soft and a timid guy would love listening to Love songs. You may be a huge fan of Rock, Classics, Hip-Hop or RnB, but to listen to your favorites by coming up with a playlist is both time-consuming and exhausting. That’s where Amazon Music Unlimited and Apple Music come in with an opportunity to listen to your favourite hits; whether old or new. It doesn’t matter where you are; in a car, at home, in the office, or at the gym working out. You get to play music with your phone or home entertainment devices by downloading to your respective devices. The opportunities these apps provide fall in the category of availability, costs, exclusivity, design and interface, or music discovery function. However, each feature differs from one app to another. You can access Amazon Music Unlimited on multiple platforms which include Android, Fire TV, iOS, Mac, on the web, and Fire Tablets among others. Also, it works well with home entertainment products like Roku, and it’s being introduced on new cars such as BMWs, Ford, and Mini. It was recently launched in the UK while the US received it’s services since October 2016. It’s also available in Germany and Australia. On the other hand, Apple music is available on Apple TV, Apple Watch, and iOS devices. Additionally, you can access it via iTunes on Mac/PC and stream your best hits through CarPlay. What sets it apart from Amazon Music Unlimited is the fact that it’s available in over 100 countries globally plus more accessing it online each month. Despite Amazon Music Unlimited being new to the game, it stands out featuring Garth Brooks’ entire collection of 16 albums. While every other artist exhausts the digital technology to sell their music, Garth has never allowed digital downloads until now. This gives Amazon a competitive advantage with this unique ability to represent Americans, the best-selling solo artist. Apple Music differs in such a way that it has exclusives from famous artists like Usher, Taylor Swift, Frank Ocean, and Lil Yachty among others. Though these exclusives offer a short window, music spreads out to other services after a while. Apple has had a lucky turn with iTunes, since it helped them offer content before anyone else. Being able to stream Katty Perry’s new hits will attract all her fans instantly. Such an opportunity has Apple Music gain popularity all through. Exclusivity has it’s perks if you know where to look for them. With Amazon Prime account, you can subscribe to Amazon Music Unlimited for just $ per month. But if you are not a prime member, $ euros per month will have your favourite music at your fingertips. A year subscription will cost you $$, while a family plan goes for $$$ annually; monthly, the family subscription goes for $$. This plan, allows you to stream music on six devices at a go. A 30-day free trial is available for users so they can familiarise themselves with Amazon Music Unlimited before subscribing. Apple Music has a student’s plan at $4.99 per month, individual Apple Music plan for $9.99, and $14.99 for a family membership of up to six people. For new users, a free period of three months is available allowing you to enjoy new hits through and through. According to users, Amazon Music Unlimited looks beautiful featuring a design skin similar to the Amazon Prime Video service. Apple music, on the other hand, is colourful and simple to use. Alexa sets Amazon Music Unlimited apart since you can play any song from any artist without shuffling through the tracks. The music library is designed has a list of recommended albums and playlists according to your listening habits. With Apple Music, you get to listen to exclusive interviews, hits, and guest hosts among others. It keeps track of your search record and uses the data to recommend the best albums with For You. You can connect with artists’ work and videos with Apple music via a social club where musicians post their progress, and you can comment or share posts to Facebook or Twitter. There are other differences like the number of tracks where Amazon Music Unlimited avails tens of millions. But that’s small compared to the 30 million tracks available with Apple Music. Sound quality on Amazon is not yet clear, but Apple deserves a 256 kbps (AAC). Paying a few dollars to listen to music may seem too much for some people, but there are benefits to those who are ready to subscribe to Amazon Music Unlimited. It’s market restriction is a challenge, but users without accessibility can always use an alternative. After unsubscribing with Apple Music, some users claim to be unable to access downloaded music from before especially during the free period. 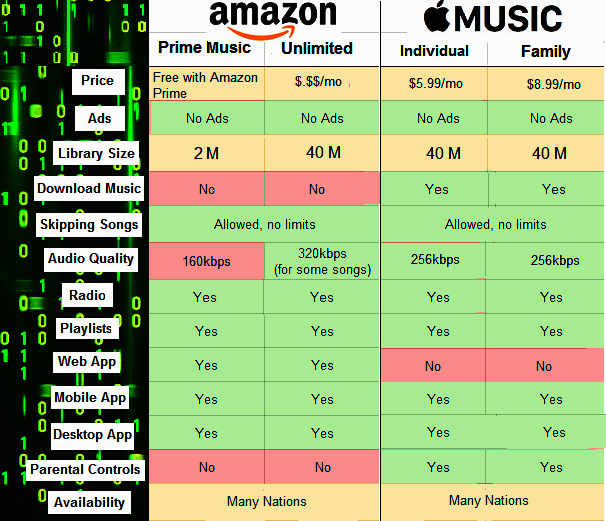 Despite these differences, the music industry is benefiting hugely, and users have an easy time accessing music.